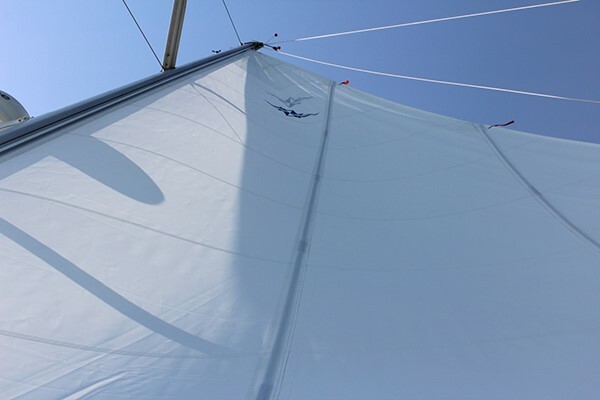 In-mast furling mainsails are popular on many cruising boats, and the conveniences are hard to beat. Quantum's Jeff Thorpe and Dave Flynn get into the details about the available options and what you need to know. 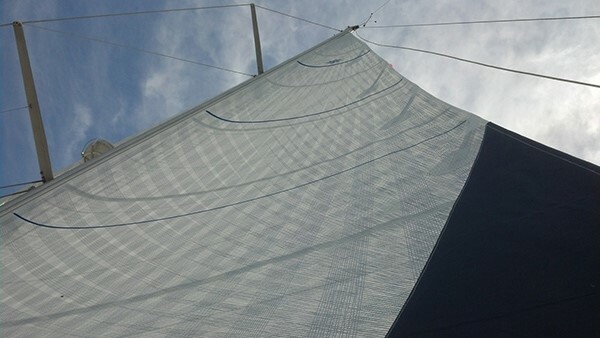 The Partial-Batten Mainsail - A MC 6500 Carbon/Technora blend sail with partial epoxy battens. The thread orientation is engineered toward the luff to help the sail hold its shape while reefed. The sail is a critical part of determining how well the system works, as well as how well the boat sails. Unfortunately, standard, original-equipment sails are often an afterthought, with cost – not quality – being the primary driver. Stretchy, poorly-designed sails that bunch up and jam as you try to furl or unfurl can quickly negate the beauty of the system. To furl well inside the limited space of the mast cavity, the sail’s shape must also be quite flat. Control of sail shape via mast bend is not possible. Without battens, there is no structure to resist compression and keep the leech from moving toward the luff under load. This causes the sail to get fuller, just when you want to see it get flatter. Vertical battens can help, but they can also create problems. The cavity size and width of the mast opening are important factors in determining if battens will work: battens add thickness to the sail and can make the sail difficult to roll in and out of the cavity. The pockets are also built-in sources of chafe, and will require maintenance over time. Vertical battens can reduce leech curl and allow for a small increase in area, but they can’t address the compression loads that cause a sail get fuller under load. The Full Vertical Batten Mainsail - - A MC Fusion 6500 Carbon/Technora blend sail with full-length RBS carbon splice battens, which allow us to achieve a roach very close to the default PHRF girths of a racing sail. The best way to make a good in-mast mainsail is by controlling stretch and finding a way to do that without conventional batten structure. This puts a premium on materials. Woven polyester (Dacron) comes in varying grades that are virtually impossible to tell apart by looking at them. Only the lowest stretch, most tightly woven materials will provide the required stretch resistance. Reducing stretch across the material’s thread line (bias) is the key. And yes, you guessed it—these are the most expensive woven materials available. On the other hand, composites designed for cruising applications actually are perfect for in-mast mainsails. They have less stretch in all directions to preserve the sail’s shape under load, keeping it flat with a straight, clean exit. They also improve the functionality of the system because the sail tends to not stretch and bunch up as it’s furled. The sail will actually be easier to furl and unfurl—when you pull on the line to turn the mandrel, the sail won’t stretch and give, but will begin to roll immediately. Composites are available in a variety of sandwich constructions with exterior skins of woven polyester (taffetas), a fiber network to bear the primary loads, and a film to provide strength in all directions. There are two basic types: tri-radials made from pre-made materials, and Quantum’s proprietary Fusion MC one-piece membranes. The Full Batten Dacron Mainsail - A low-stretch Dacron sail with RBS epoxy splice battens. Although this sail has batten structure, it shows stretching & the draft moving aft as it was made with woven sail cloth instead of a membrane. 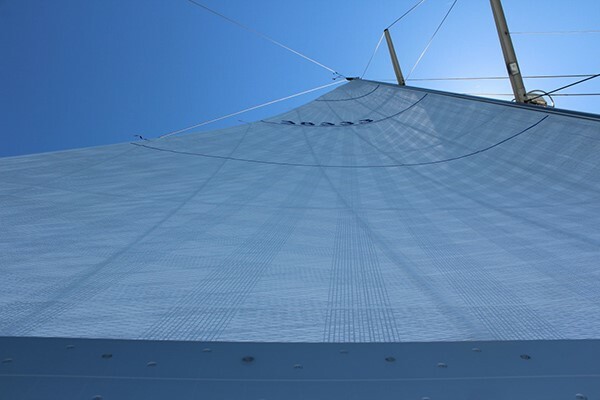 Tri-radial mainsails take advantage of radiating panels of pre-made materials out of the three corners of the sail to better align the fabric thread line with sail loadings. The length or “warp” fiber of the material is oriented to align with the primary load path. Better alignment creates lower stretch improving the sail’s ability to hold its shape. There is a broad spectrum of material options in tri-radial construction. They range from woven materials made with their strength in the warp direction (as opposed to the fill direction of classic woven polyester), to composites with multiple layers of material and a variety of fiber options. Tri-radials provide a performance upgrade for those who are looking for more than a traditional woven polyester sail can provide. Fusion MC cruising mainsails are engineered on a sail-by-sail basis as one-piece membranes with custom fiber mapping tailored to the sail’s design purpose and expected usage. They can utilize a variety of fiber types. They provide lower stretch and greater strength, improving both initial performance and long-term shape retention without sacrificing durability and reliability. They represent the ultimate combination of performance and durability. Would a furling boom address/avoid the geometric/loading issues that you discuss above? Example: Horizontal battens would be possible with furling boom.